There is no Snow Emergency in effect. Sign up for Snow Emergency email alerts here. Under the city's Snow Emergency policy, Osseo is divided into two areas: District A and District B. District A includes residential areas and all streets east of 1st Ave NE and all streets west of 1st Ave NW. It also includes streets south of County Road 81. No parking is allowed on the first night of a Snow Emergency, from 10 pm to 6 am. Parking is allowed on the second night. District B includes the downtown area, including all streets between and including 1st Ave NE and 1st Ave NW. No parking is allowed for two nights of the Snow Emergency, from 10 pm to 6 am. Parking is allowed in municipal Snow Emergency Parking lots, as space permits. 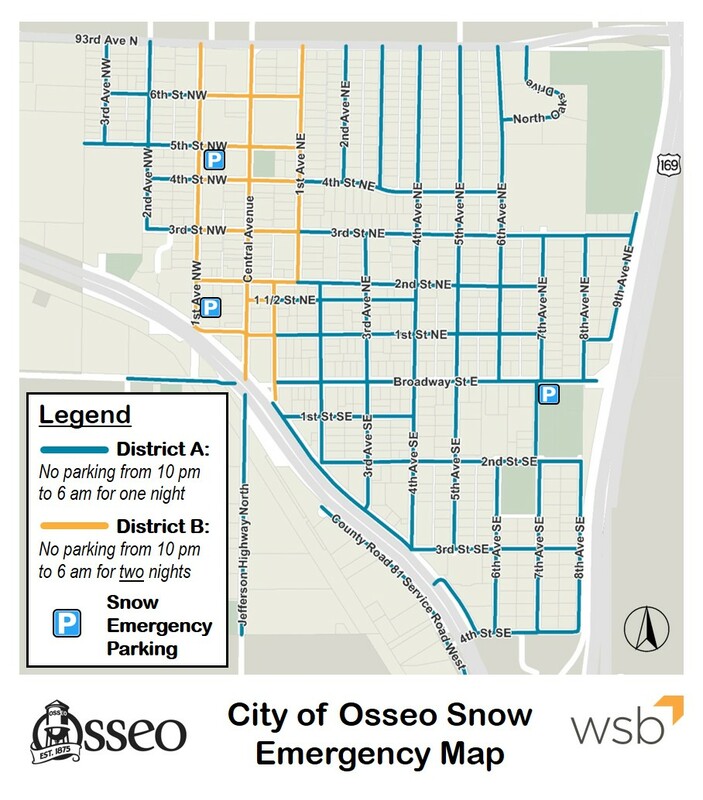 In an effort to more efficiently alert residents when City crews need to plow and clear streets of snow, the Osseo City Council adopted an updated snow emergency policy in 2017. The new policy will help residents and vistors know when the the City has declared a snow emergency event, and what steps they can take to ensure vehicles are out of the way for snow plowing. Who determines if there will be a snow emergency? A City of Osseo Public Services employee, who is currently on-duty or an on-duty Osseo Police Officer, will measure any current snow fall at the Osseo Public Works Facility parking lot when there appears to be an accululation of 2 inches or more (located at 800 Broadway Street East). If 2 or more inches have fallen in a single "snow event", then the Public Services employee or Police Officer will report to the Public Services Director or Police Chief who will declare an official snow emergency. When can a snow emergency be declared? Residents will be notified of a snow emergency declatation before 8:00 PM in order to be effective the same day, beginning at 10:00 PM. How will residents be notified that a snow emergency has been declared? A) An official snow emergency declaration banner will appear on the City's homepage. You can log on to www.discoverosseo.com to check for potential snow emergency events. B) Residents who opt into the email notification system will recieve an email from the City alerting them to a snow emergency declaration. If you'd like to receive email alerts from the City of Osseo, please log on to the City's website and in the middle of the homepage is a section where you can sign up for notifications. Please note: your email address will NOT be used for any purpose other than sharing important City alerts. C) The City will also post all snow emergencies on the City's Facebook page and Twitter account. To get snow emergency notifications via Facebook, search "Discover Osseo" and like our page. You can also follow the City's Twitter account (@CityofOsseo). The City will post snow emergency notifications and like to our website for further information. D) A message will be posted to the Osseo Gateway Sign at the intersection of County Road 81 and Jefferson Highway. E) The City will alert local WCCO Television to include Osseo snow emergencies on their scrolling notification bar at the bottom of your TV screen. F) A phone recording, declaring that the City of Osseo has declared a snow emergency, will be activated when residents call the City of Osseo Snow Emergency Hotline (763-425-SNOW). The recording will give callers further infomation on the snow emergency declaration. What are the parking restrictions during a snow emergency? When a snow emergency has been declared, residents are not allowed to park vehicles on City streets starting at 10:00 PM that evening until 6:00 AM the following morning. Then, from 6:00 AM to 10:00 PM the next day, residents are allowed to park on City streets. However, beginning at 10:00 PM until 6:00 AM the following morning, parking will be prohibited In District B (only). After 6:00 AM on the second day of the snow emergency, the emergency will be considered over and residents may park vehicles on the City streets. 4:00 PM on Tuesday: City declares a snow emergency and notifies residents/visitors. 10:00 PM Tuesday to 6:00 AM Wednesday: No parking allowed on City streets in either District A or B. 6:00 AM to 10:00 PM Wednesday: Parking is allowed on City streets. 10:00 PM Wednesday to 6:00 AM Thursday: No parking allowed on City Streets in District B (only). 6:00 AM on Thursday and on: Snow emergency has concluded and parking restrictions are lifted. If, during a officially declared snow emergency, vehicles are parked on the street, tickets will be issued for failure to move vehicles off the street, and vehicles will be towed at the owner's expense. Where can residents park vehicles during snow emergencies? Residents who live west of Central Ave: Parking is available in the City-owned parking lot located at 108 1st Ave NW - located just north of Heinen's Motorsports. Click here for a map of this location. You may also park in the City Hall parking lot, located at the corner of 1st Ave NW and 5th Street NW. Crews will plow these areas early in the snow emergency process to allow for residents to park at these locations. Residents who live east of Central Ave: Parking is available in the St. Paul's Lutheran Church parking lot, located at 701 Broadway Street East. Please park in the far northwest corner of the church parking lot. Click here for a map of this location. Can snow plow crews prevent driveways and/or alley entrances from being blocked? Since all snow must be cleared from the roadway in order to keep public roadways safe, snow plow crews have to push snow to the sides. It is very difficult to keep driveways and alley entrances from becoming blocked in on initial passes. Crews will make every effort possible to minimize this problem and may return to alley entrances when possible. Driveways may be blocked, however, when the City receives a large snowfall amount. Again, crews will make every effort to minimize these issues. What are the main snow plow routes? The map below shows Osseo streets highlighted in various colors. Roads highlighted in green will be primary snow routes. This means crews will plow these streets first during a snow emergency. The green highlighted streets are more heavily trafficked routes and streets that service Osseo schools and businesses. The routes highlighted in yellow and blue are considered secondary plow routes. These sections will be plowed following the primary route, flip flopping which of the two will be plowed first. My street appears to have been plowed curb-to-curb. Can I park on that street during a snow emergency? The simple answer is NO. Many times your street may appear to have already been plowed curb-to-curb. But appearences can be deceiving. Sometimes, plow crews may need to come through on a second pass to ensure snow is pushed up over the curb in order to make the street safe for travel and parking. It's because of this that the no parking restrictions during a declared snow emergency will be strictly enforced to avoid any potential confusion. If you park your vehicle on any City street during the 10:00 PM to 6:00 AM no parking time, your vehicle could potentially be tagged and/or towed at your expense. Error on the side of caution. Do not park your vehicle on the public street during a snow emergency. Have people visiting from out of town, or family members who may not live in Osseo at your residence? Make sure they are aware of the no parking restrictions during snow emergencies as well. My vehicle was towed. Where can I pick it up? Osseo residents are reminded that citizens living in residential districts are required to completely clear public sidewalks within 24 hours of any snowfall. Failure to comply will result in potential citations to the property owner. If the City must clear the sidewalk after the property owner fails to do so, the property owner will be billed for that snow removal service. City crews will strive not to push snow up onto residential sidewalks. In the Fall 2014 the Osseo City Council adopted an ordinance which listed the requirements for snow removal from the sidewalks in the Central Business District and the R-2 Residential District (apartment areas along 1st Avenues). We hope to keep the Central Business District snow-free to allow residents and customers to park and walk in a safe and convenient manner. City crews will remove the snow from streets as soon as possible and it is the responsibility of the property owners in the Central Business District and the R-2 Residential District to remove the snow from the sidewalk in front of their business. The City will vigorously enforce this ordinance and will have the snow removed from your property if you do not remove it. 1. During daylight hours (8 AM to 5 PM, 7 days a week) you are required to remove the snow from the sidewalk within 4 (four) hours of when it was deposited. This means you have to remove it 4 hours after it starts snowing, even if it is still snowing. You will need to have the sidewalk shoveled all day between the hours of 8 AM and 5 PM. 2. If the snow falls outside of these hours, your responsibility will be to have the sidewalk snow removed as soon as possible after 8 AM and clearly by 12 Noon. 3. The snow should be completely removed from the sidewalk to the street. A) If it starts snowing at midnight and stops at 5 AM, you should have the snow removed as soon as possible but by 12 Noon at the latest. B) If it starts snowing at 9 AM and continues to snow until 6 PM, you should have the snow removed initially by 1 PM and then completely by 12 Noon the next day. C) If it starts snowing at 1 PM and stops at 4 PM, snow should be removed by 5 PM same day. 1. If the snow is not removed by the required time, the police department will issue a ticket which will cost the property owner approximately $239. 2. If the snow is not removed within 24 hours of the issuance of the ticket, the City will have the snow removed and assess the property owner for the cost. 3. This ordinance will be enforced each snowfall 7 days a week. We thank you for your help in making Osseo a walkable community under all conditions. If you have any questions on these rules, please call City Administrator Riley Grams at 763-425-3861.